Samsung has added a new member to its bada powered Wave series of smartphones. The new member with a sleek and user-friendly design is named Wave 578. A unique feature of the phone is that it comes equipped with an NFC (Near Field Communications) chip. The NFC chip will allow users to perform a number of activities like payment, tag reading without any physical contact. The Smartphone will be able to support NFC globally. The other features of the phone include a sleek metallic body, a 3.2 inch touch screen with a screen resolution of 240*400 pixels and a 3.2 Megapixel camera. It also has a front facing VGA camera. 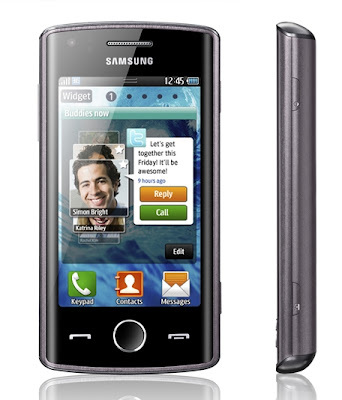 It would run on Bada OS 1.2.It also comes with a 3.5 mm audio jack and a memory expandable to 32 GB. It also has interesting features like a Proximity Sensor and an Accelerometer. Apart from these it comes equipped with the normal features like Bluetooth, WI-Fi etc. The exact price of the Smartphone is not yet known but the device is expected to be released sometime in May this year. We will have to wait and see whether Wave 578 with all its features like sleek design, improved social experiences, and enhanced connectivity takes off or falls dud.